you guys up for another recipe? i hope so because we go crazy for these breakfast cookies at our house and devour them so quickly that i recommend making 2 batches at a time. they are perfect for a quick breakfast or after school snack on the go and you can freeze the extras for later. 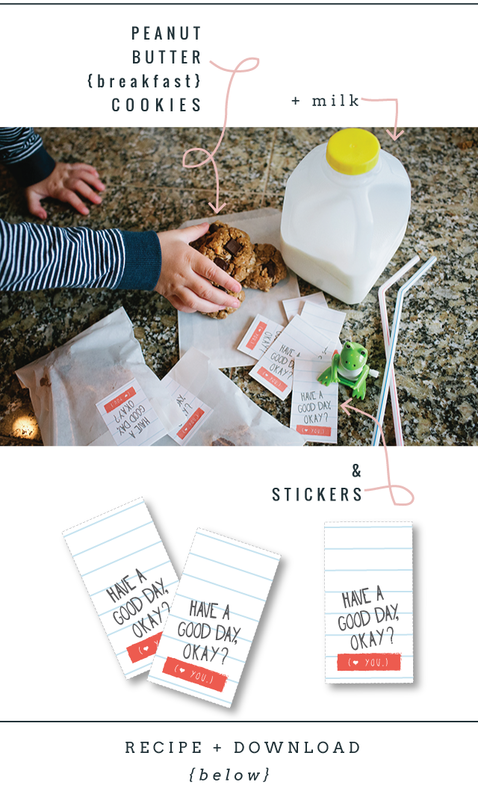 i also thought i would share the stickers i made for those crazy mornings when everyone is running in different directions. download, print and cut so you have them handy…. links and recipe are below! in a large bowl mix peanut butter, brown sugar and coconut oil until combined and smooth. mix in eggs. add rest of ingredients and stir until combined. using your hands (or a cookie scoop) make 2-inch balls, place on prepared baking sheet and press down slightly. cookies won’t expand while baking so you can place them closer together – i usually fit 18 or so. bake for 11 minutes. let cool before serving. great for breakfast, lunch or snack time! freeze leftovers and thaw for busy days! what do you usually hand the kids on their way out the door when you didn’t have time to sit down for breakfast? These sound delish! I will definitely be making them. Do you melt the coconut oil? Can you tell me what brand/size stickers you used to print these? Thanks! Love this recipe as do my kids. I’ve added chia seeds, hemp hearts, Nutella, sprinkles, coconut to switch it up sometimes and they always work great. Thanks for the recipe!